In an age where the internet is a big part of lifestyle and keeping in shape is essential to staying healthy, it can be hard to balance both. Sitting in front of a computer 8 hours a day for work and/or spending a couple more in leisure fun means a lot of sitting around on your bum! But this is one area of exercise while sitting in front of the computer that will keep you in tip-top shape! The brain, my friends, is a terrible thing to waste. Mental stimulation is important to you well-being. Engaging the brain has benefits that will help prevent depression, loneliness and boredom. It is beneficial in increasing the memory and get your creative juices flowing. The brain is one of the most important organs in your body and keeping to running smoothly is vital to good health. So, what exercises promote healthy brain function? Sit right there in your chair and don’t move a muscle, because you are already on your way to good brain power exercise. Playing games is one fun way to keep the brain active and healthy. 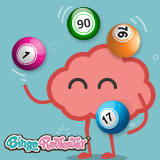 Did you know that one way to boost your brain power is to play bingo? All this time I bet you thought it was all about winning and little did anyone know your brain was getting a workout. Next time you kick back and indulge in a little “me” time forget about feeling guilty you're not sweating in a gym. Your working another part of the body with every bingo call made!